The special device makes possible to reuse any drupes that remain attached to twigs. The considerable amount of raw material is recovered automatically and the machine discharges the twigs without olives and leaves on one side and, on the other side, the clean olives are routed to the other olives. Like all Pieralisi machinery used for processing olives, before proceeding to the washing stage, the twig remover is designed and built to prevent, when drupes pass through, impact or contact with metal parts that could cause the olive skin to tear, thereby preventing the dispersion of oil while processing the paste. 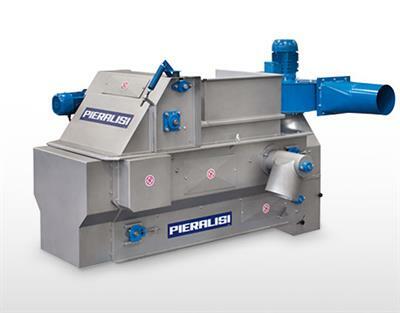 The twig and leaf remover operates automatically and continuously, feeding the olives directly into Pieralisi washing machines. No reviews were found for Pieralisi - Model FP - Twig and Leaf Remover. Be the first to review!